The aging report provides the detail that goes along with the initial application. This report reflects the amounts owed by your customers and the length of time it takes them to pay on the invoices. An invoice that is paid within 30 days has a lower charge than one paid in 45-60 days. The first question every business wants to know is, “Will factoring cost me?” Don’t be frustrated when the response is, “It depends.” The industry, strength of the customer, and length of time it takes to receive payment affect the advance rate and the discount fee. 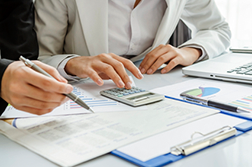 The volume of invoices a business plans to factor also impacts pricing. A company desiring to factor $10,000 every month will receive better rates than a business factoring $2,000 on a sporadic basis. The terms offered by the factor can often be negotiated and will ultimately be spelled out in the contract. This due diligence process takes an average of 5-10 days at most factors. Simplicity Financial Solutions normally takes less than half that time. Once the initial review process is complete it can take as little as 24 hours to receive cash for invoices with approved customers.